Did you know that your face is effecting your yoga?!?! Smile to improve your yoga! Read this next blog to learn the effects of smiling. How many times have you heard this cue from a yoga instructor? If you are hearing this command in class, then likely the last thing you are thinking of at the moment is a cheekish grin. Maybe you’d oblige to showing your teeth, and maybe let out a little growl to express your disdain for the asana that you may find yourself in. This is really a nice cue, and though I will admit, it’s one command I loathed for some time, it takes a bit of deeper understanding of how a smile in yoga can empower your yoga practice. I’ll take a step back from smiling, and use the word softness since there are some of us that just take things too seriously to smile randomly, and some of us may take our yoga so serious, that a smile is not warranted. I like to think that there are poses that need a very serious gaze, or dristi, yet there are some that are complimented with a soft face or a warming smile. A person’s facial expression is always the fastest response of the mind’s input and the most universal form of communication, transcending all language barriers between human beings. You have more facial expressions than you probably realize and they include expressions of pleasure or displeasure , judgment or approval, understanding or disagreement. Facial expressions send messages to those around us, but there is also two-way communication between the face and the mind. You can test this yourself . 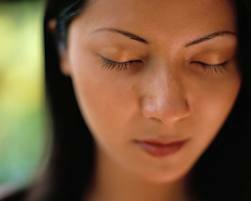 Take a moment to cultivate a sense of awareness in the body and turn your attention inward. Experiment with different contortions of the face and watch where the mind goes. What happens when you smile? What feelings arise when you furl your brow? Does frustration arise when you clench your jaw? Do you feel attractive with fluttering lashes and a coy smile? I’m asking you to experiment with facial expressions and their accompanied emotions, thoughts and feelings because this is a counterpart to your internal dialogue, or your mind chatter. Yoga teaches us that where the mind goes, the body follows and vice versa. But often, facial expressions are left out of this teaching. Smiling is one of the self-evident principles taught in yoga. This is why you hear it so often. When students are in difficult postures, the teacher may likely see contorted faces, clenched jaws and expressions that tell the story about what is going on inside the student’s body. When we smile, we instantly feel uplifted, lighter, etc, and this is due to the chemical response of the brain in reaction to a smile. Give smiling a try. Or maybe even your version of a soft facial expression. Next time your internal voice is screaming, “I HATE THIS POSE!” See what happens if you smile. Can you tell yourself that you hate something while you are smiling? In yoga, your face always tells the story. Change the expression on your face, change the story of your practice. 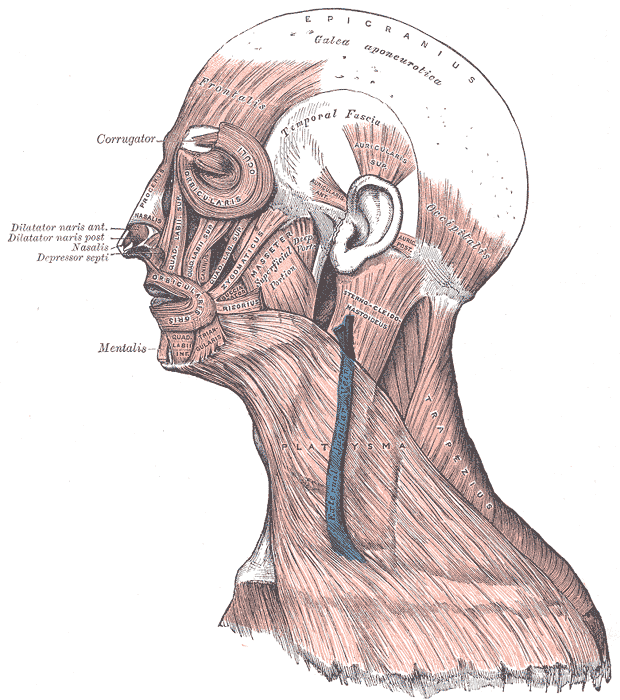 The 20 muscles of the face. This faithful reproduction of a lithograph plate from Gray’s Anatomy, a two-dimensional work of art, is not copyrightable in the U.S. as per Bridgeman Art Library v. Corel Corp.; the same is also true in many other countries, including Germany. Unless stated otherwise, it is from the 20th U.S. edition of Gray’s Anatomy of the Human Body, originally published in 1918 and therefore lapsed into the public domain.